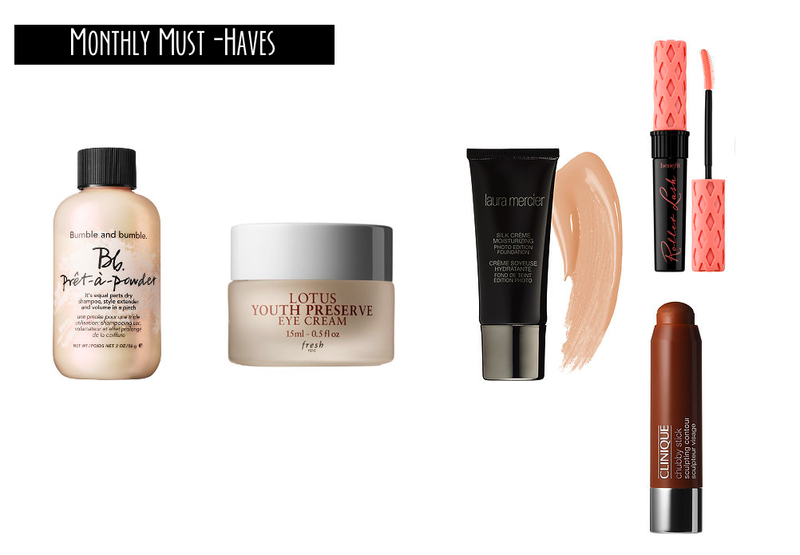 With March coming to a close, we’re back with a new installment of Monthly Must-Haves! As much as we’ve been trying to refrain from buying more beauty products we don’t need lately, the struggle is all too real when Sephora sends us enticing emails notifying us that we can now receive SIX free samples instead of the usual three, but hurry – it’s a limited time only deal! While we didn’t cave this time, here’s what we would have bought (and probably still will). Fresh Lotus Youth Preserve Eye Cream – We’re in desperate need of a new eye cream and have been hearing good things about this one. We’ve been longtime fans of the Fresh tinted balms and their lotions and masks in general, so we’ve nearly decided this will be our next pick. Bumble & Bumble Pret a Powder – An all-in-one dry shampoo, volumizer, and style extender? Sign us up. Laura Mercier Silk Creme Moisturizing Photo Edition Foundation – We’ve long loved Laura Mercier bases – the tinted moisturizer, her silk creme foundation – she’s mastered them all, so we have high hopes for this new addition. We’re intrigued by a photo-ready foundation that won’t leave us with a white-cast, but will still be moisturizing and long-wearing. Benefit Rollerlash – Every new Benefit release comes with a lot of hype. They crush all things social media & YouTube beauty vloggers to really get the makeup crowd excited for their new release, and we love them for it. They always deliver with fun, cute packaging and clever products, so we’re sure this one is no exception. Plus, the curled wand makes us feel better about forgetting to curl our lashes daily. Clinique Chubby Stick Sculpting Contour – With contouring taking over quickly as 2015’s biggest makeup trend so far, we’re interested in the ease of application with Clinique’s latest release. It reminds us of the NARS Multiples we love so dearly and can’t wait to see what sort of cheekbones it can coax out of hiding.